Solution: The 2 kg ball is thrown at the suspended 20 kg block with a velocity of 4 m/s. The coefficient of restitution between the ball and the block is e=0.8. a) Determine the maximum height h to which the block will swing before it momentarily stops. b) If the time of impact between the ball and the block is .005 s, determine the average normal force exerted on the block during this time. Take e=0.8 . The 2 kg ball is thrown at the suspended 20 kg block with a velocity of 4 m/s. The coefficient of restitution between the ball and the block is e=0.8. 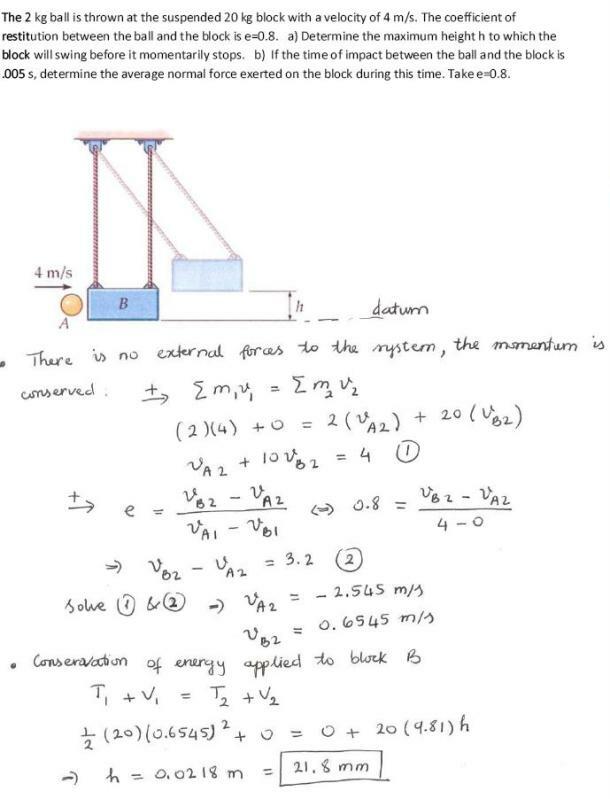 a) Determine the maximum height h to which the block will swing before it momentarily stops. b) If the time of impact between the ball and the block is .005 s, determine the average normal force exerted on the block during this time. Take e=0.8 .